The Magenta “T” is easily recognized as the symbol for T-Mobile. It stands out both because it is a single letter “word” and an unexpected color in the crowded cellular communications marketplace. 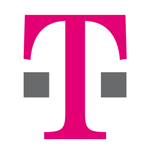 T-Mobile and its parent Deutsche Telekom registered a trademark for magenta for mobile telephone materials which may sound rather limited however when Intel introduced magenta in the Centrino logo the legal teams of Deutsche Telekom and T-Mobile were quick to make them aware of the breadth of the trademark protection. Intel didn’t challenge the trademark and instead chose an alternate color.